Published: Oct. 23, 2011 at 05:02 p.m.
(14:02) J.Freeman pass short middle intended for K.Winslow INTERCEPTED by B.Urlacher at CHI 9. 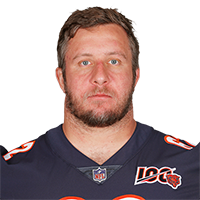 B.Urlacher to CHI 18 for 9 yards (D.Hardman). FUMBLES (D.Hardman), RECOVERED by TB-A.Benn at CHI 19. A.Benn to CHI 19 for no gain (B.Urlacher). PENALTY on TB-T.Larsen, Face Mask (15 Yards), 15 yards, enforced at CHI 14 - No Play. Chicago challenged the fumble ruling, and the play was REVERSED. J.Freeman pass short middle intended for K.Winslow INTERCEPTED by B.Urlacher at CHI 9. B.Urlacher to CHI 17 for 8 yards (D.Hardman). PENALTY on TB-T.Larsen, Face Mask (15 Yards), 15 yards, enforced at CHI 17.